Apart from FOOD NETWORK, I watch an Arabian Food Channel named FATAFEAT. Though I don’t try their recipes (mostly lamb and fish), I would like to know and watch their culture, cooking and their presentation. Indian Recipes are showed less and I would never miss them. I saw this recipe two days back and found to be very different. I noted down and made immediately. This is less hot and more spicy. I wanted something more hot as side dish. So I made Pepper Chicken. Believe me, it is my own method. I learnt from Srivalli that Chicken can be marinated with Vinegar and not necessarily, always Yoghurt. Chop Onions and Coriander Leaves into very fine pieces. Wash and clean Chicken. Cut them into medium pieces. 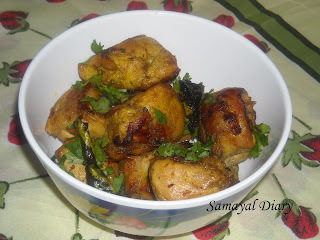 Rub Yoghurt and sprinkle Garam Masala & little Salt over Chicken pieces. Refrigerate for 1-2 hours. Grind Ginger and Garlic to a smooth Paste. Heat Oil in a Pan. Add marinated Chicken pieces. Shallow fry until it gets a slightly roasted coating. Keep it aside. Heat Oil in the same Pan. Add Aniseeds. When they crackle, add other ingredients mentioned under seasoning. When they turn slightly brown, add finely chopped Onions and fry till translucent. Now add Ginger-Garlic paste and all the other powders and sauté for a while to get rid of its raw smell. Now add Yoghurt and Cream. Stir well and add shallow fried chicken pieces, Salt and Water. Cook till done. Garnish with Coriander Leaves, Raisins and sliced Almonds. Wash and Clean Chicken Pieces. Cut into medium pieces. Add Vinegar; sprinkle ¼ tsp Pepper Powder and salt over the Chicken pieces. Keep it aside for 20-30 minutes. Chop Onions and Coriander Leaves. Slit Chillies. Chop Ginger and Garlic into very fine pieces. Heat Oil in a Pan. Add Aniseeds. When they crackle, add cloves. Add chopped Ginger, Garlic, Onions and Chillies when cloves turn slightly brown. Fry till Onions turn golden brown. Now add the marinated Chicken pieces, Chilli Powder and ½ tsp Pepper Powder and Salt. Fry till done. I missed to watch how the Chef marinated for Mughalai Chicken Curry. I used Garam Masala and Yoghurt. Ginger Garlic Paste can also be used according to your taste. 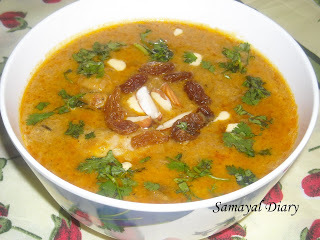 Almonds and Raisins can be avoided as most of us like my Husband do not like them in a Curry. Instead of chopped Ginger and Garlic, Ginger-Garlic Paste can also be included to prepare Pepper Chicken. 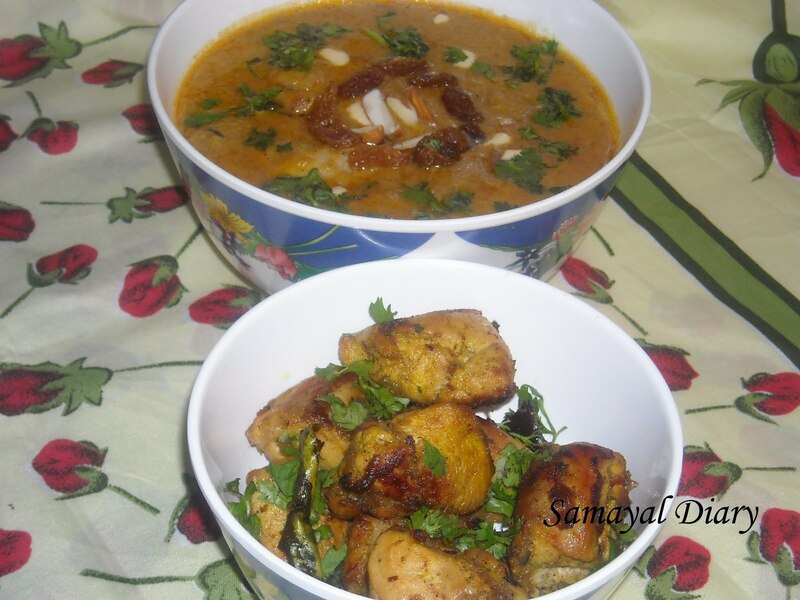 Another drool worthy recipe...you r tempting me a lot n made me hungry now:) thanx for your lovely thoughts at my space...will try all your chicken recipes n I shared it with my sister also...thanx for sharing!!! Very exotic recipe ~ the combo of ingredients is awesome !